Take a look at the skill classes and trips coming up! Descriptions and more information are below. Call (406) 243-5172, email or visit us in person for more information. The Outdoor Program is located on the northeast corner of the Fitness and Recreation Center. Classes are open to the public, while trips are open to the UM community only. All pretrip meetings are held in the Outdoor Program. An introduction to mountaineering. We will be teaching trip planning, self arrests, rope travel and how to build basic snow anchors. Spring Break! You cannot find a better way to spend your vacation than in the beautiful desert of Capitol Reef National Park. Spend a week backpacking through a remote area in the Utah desert, one of the least utilized national parks. You will navigate your way through narrow slot canyons and high desert walls. It is a trip you will never forget. This is a hands-on introduction to bicycle maintenance and mechanics. Participants will be able to fine tune their derailleurs, brakes and bearings and learn the art of wheel-truing. Also, each participant will obtain the knowledge needed to take their own bike apart in order to clean, lube and grease all the moving parts. The trip has changed people's lives! Ask anyone who has attended. The trip starts out with some acclimatization hikes in the areas around Huaraz, then continues as a four-day trek (one of the most popular) in the Cordillera Blanca, the Santa Cruz Trek. It is approximately 30 miles of trail, and the trek includes views of spectacular glaciated peaks, alpine valleys, scattered quenual forests and crosses a pass of 14,700 feet. With donkeys helping carry the load, the trek is made even more enjoyable and allows you to focus your attention on acclimatization instead of how heavy your pack feels at altitude. Navigationally speaking, the route is easy to follow and if there are questions the donkey driver knows the way. In regards to the mountaineering course, this course will prepare participants with little to no mountaineering experience to be contributing members of a climbing team by first taking a careful look at the many hazards that snow covered mountains offer, then systematically learning the skills and techniques to combat these dangers. A peak climb objective is included to provide participants with a supervised climbing experience in which they can take the lead (as appropriate) of the climb with an instructor supporting and advising as necessary. The WFA 16-hour (with optional 4-hour CPR) course provides a great introduction to wilderness medicine for anyone spending time in the outdoors. The course focuses on injury and illness prevention, patient assessment, long-term injury management, improvised splint and litter construction and environmental emergencies. Available for one credit as HHP 195 course. Aerie's 72-hour Wilderness First Responder (WFR) course is designed for outdoor professionals and outdoor enthusiasts, preparing them to care for injuries and illness in remote, challenging environments. The course is fast-paced, challenging, hands-on and fun. Available for two credits as HHP 249. 200+-hour Wilderness Emergency Medical Technician course includes: WEMT - 2 years, National Registry EMT-Basic - 2 years, American Heart Association Healthcare Provider CPR - 2 years, Avalanche Awareness, Swiftwater Rescue First Responder - 3 years. Available for 3 credits as HHP 331. This class focuses on learning to lead. Skills covered include working on rope management, clipping, ratings and guide books, falling, cleaning a route and more! Instruction will take place at the rock climbing wall in the Fitness & Recreation Center. Come climb fresh new routes and get prepped for climbing outside soon! 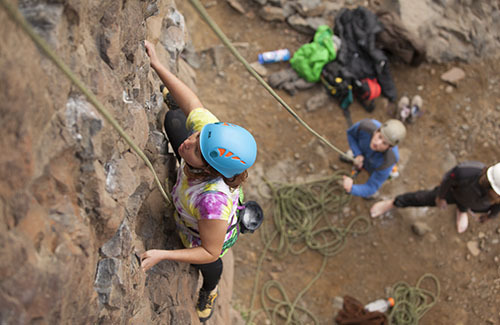 This rock climbing class is for all levels, from just learning how to belay to lead climbing. Participants, however, need to have taken a belay clinic or know how to belay to attend this class. The group will leave at 9 a.m. and return at 4 p.m. Location TBA. Every Wednesday, 9-10:30 p.m., from the beginning of fall semester through October and from the beginning of spring semester through March. It's a perfect time to climb in a comfortable, fun setting. Women instructors are on hand, if needed. All women and non-binary participants of all skills levels and abilities are encouraged to attend. Register the day of at the front desk of the Fitness & Recreation Center. This is a great clinic to learn what it takes to rope climb on the wall. It covers fundamentals such as climbing gear, knots, and belay techniques and prepares you for the belay certification test. Register the day of at the front desk of the Fitness & Recreation Center. This trip is an easy way to get out, shape up and brighten up winter. The day begins with a review of basic cross-country ski techniques and some practice exercises that can improve your technique. We will then tour the cross-country ski trail and check out animal tracks and winter ecology along the way. This trip is designed for those with no experience or cross-country skiers who desire to improve their skills. This class follows the Level 1 guidelines of the American Avalanche Association. There are two evening sessions and two full field days. The evening classes are from 5-8 p.m. on Jan. 10 and 11 in ED room 214 on the UM campus. Jan. 12 and 13 are in the field. This class follows the Level 1 guidelines of the American Avalanche Association. There are two evening sessions and two full field days. The evening classes are from 5-8 p.m. on Jan. 17 and 18 in ED room 214 on the UM campus. Jan 19 and 20 are in the field. This class follows the Level 1 guidelines of the American Avalanche Association. There are two evening sessions and two full field days. The evening classes are from 5-8 p.m. on Jan 24 and 25 in ED room 214 on the UM campus. Jan. 26 and 27 are in the field at Lost Trail Pass. Gear up for the winter ski and snowboard season! During the one-hour class (6-7 p.m.) learn how to do base repair, wax boards and sharpen edges through hands-on instruction. This workshop consists of two evening lectures and a field trip. The field trip will be conducted for skiers and snowboarders. The workshop free, but the optional ski/snowboard field day fee is $30. There is no registration for the evening lectures, and field trips will be organized at the end of the second lecture. Skiers or snowboarders attending the field session must be able to easily negotiate intermediate slopes. For more information contact info@missoulaavalanche.org. Lectures - Tues., Feb. 5, and Thurs., Feb. 7, from 6-8 p.m. North Underground Lecture Hall on the University of Montana campus. 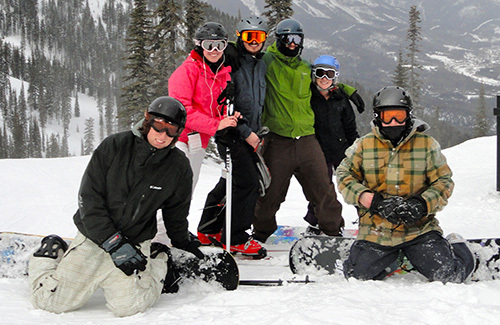 There is an optional field trip on Feb. 9 for skiers and snowboarders. Must attend both lecture days to be eligible to participate in field day. Glacier National Park is one of the most beautiful places on earth, especially in winter. You will cross-country ski the trail system along the North Fork of the Flathead River and lodging at the charming North Fork Hostel along the river. Spring break! Spend a week canoeing the Labyrinth Canyon of the Green River in Utah. It is considered by some to be one of the premier canoeing trips in America. Canoe 45 miles from Ruby Ranch to Mineral Button with several side hikes along the way. Classroom days (4, 11, 18, 25) are in ED 312 from 6-8 p.m., and the location of the field days (April 20 & 27) will be announced in the classroom sessions. Instruction provided by expert guide George Kesel. This Whitewater Rescue Course is designed for professional rescuers, raft guides and whitewater paddlers. Day one covers rescue fundamentals, including equipment, organization, basic rules reading water and a raft trip through the Alberton Gorge focusing on inflow risk management and rescue situations. On days two and three we'll develop and practice skills on the river. We always modify the class based on the students rescue or paddling experience and background. While the initial emphasis is safety and self rescue, the class offers an in-depth look at reading water, recognizing and avoiding hazards, quick rescue techniques, boat-based rescues, dealing with boat wraps and entrapments, technical rescue systems, and a variety of practical scenarios. We progress from a solid foundation of rescue skills and practice into rescue scenarios on the river. No experience is necessary. The class is challenging, fun and tailored to the students' needs. It is certified through the Whitewater Rescue Institute. 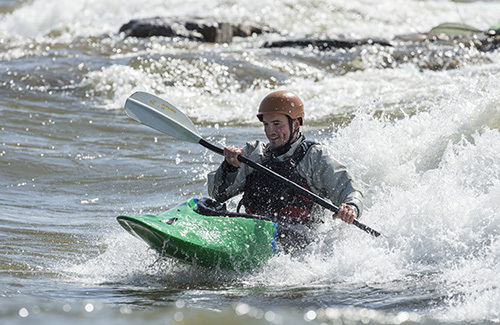 This is an introduction to whitewater kayaking with a nice progression that graduates from the pool to beginning river running with an easy run through town to an all day river trip. You will learn basics strokes, how to read whitewater, the roll and an introduction to moving water and boat safety. March 15 and 22 and April 5 (8:30-10:30 p.m. pool days), April 12 and 19 (river days, 5-8 p.m. eddy and town on the Clark Fork River), April 20 (all day on the Blackfoot)*. You are welcome to bring your own boat or use one of ours. *River days are subject to be changed based on temperatures and river levels. This is an introduction to whitewater kayaking with a nice progression that graduates from the pool to beginning river running with an easy run through town to an all day river trip. You will learn basics strokes, how to read whitewater, the roll and an introduction to moving water and boat safety. April 11, 16 and 18 (8:30-10:30 p.m. pool days), April 23 and 25 (river days, 5-8 p.m. eddy and town on the Clark Fork River), May 5 (all day on the Blackfoot)*. You are welcome to bring your own boat or use one of ours. 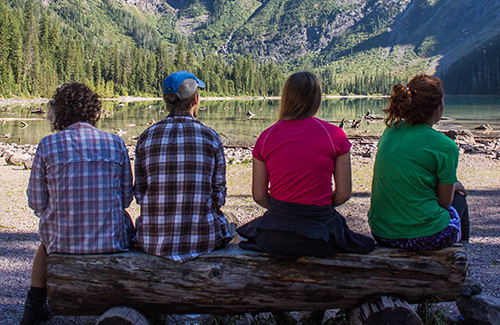 Campus Recreation is an equal opportunity service provider that conducts certain activities under special permit with the US Forest Service, Montana Fish, Wildlife and Parks and the Bureau of Land Management. The University of Montana's Campus Recreation trips are permitted on the Lolo, Bitterroot, and Clearwater National Forests (Clause VII.B.). The UM Outdoor Program is partners with Leave No Trace Center for Outdoor Ethics and a member of the American Canoe Association, Trout Unlimited, The Access Fund and the Professional Ski Instructors of America.